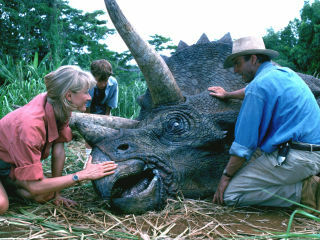 One of the most thrilling science fiction adventures ever made, and featuring one of John Williams’ most iconic and beloved musical scores, Jurassic Park transformed the movie-going experience for an entire generation and became the highest-grossing film of all time in 1993, winning three Academy Awards®. Masterfully directed by Steven Spielberg and based on the best-selling novel by Michael Crichton, Jurassic Park transports us to a secluded island where scientists have succeeded in reviving the age of dinosaurs in a brand new, immersive theme park, the likes of which has never been seen before. Renowned paleontologists Alan Grant (Sam Neill) and Ellie Sattler (Laura Dern) are part of an exclusive group invited to the island for a sneak preview of the park’s wonders. When things go terribly wrong, they must fight for their lives against unimaginable dangers in a desperate attempt to escape from a world gone mad ... a world in which dinosaurs once again rule the earth. Audiences can experience this ground-breaking film as never before: projected in HD with a full symphony orchestra performing Williams’ magnificent score live to picture.